Paxil (Paroxetine) Cautions: AT LEAST 1 TO 2 WEEKS, and sometimes up to 4 weeks, may pass before this medicine reaches its full effect. Paxil (Paroxetine) IS NOT RECOMMENDED for use in children or adolescents under 18 years of age. IT IS IMPORTANT THAT ALL PATIENTS, including those under 18, consult with their doctor before stopping this medicine. DO NOT SUDDENLY STOP TAKING Paxil (Paroxetine) without checking with your doctor. THIS MEDICINE MAY CAUSE drowsiness. Do not drive, operate machinery, or do anything else that could be dangerous until you know how you react to this medicine. DO NOT DRINK ALCOHOL while you are taking this medicine. BEFORE YOU BEGIN TAKING ANY NEW MEDICINE, either prescription or over-the-counter, check with your doctor. FOR WOMEN: IF YOU PLAN ON BECOMING PREGNANT, discuss with your doctor the benefits and risks of using this medicine during pregnancy. THIS MEDICINE IS EXCRETED IN BREAST MILK. IF YOU ARE OR WILL BE BREAST-FEEDING while you are using this medicine, check with your doctor or pharmacist to discuss the risks to your baby. 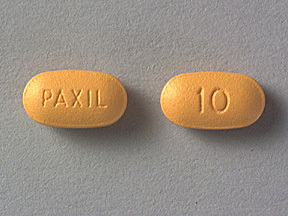 Possible Paxil Side Effects: SIDE EFFECTS, that may go away during treatment, include nervousness, trouble sleeping, headache, drowsiness, fatigue, nausea, vomiting, diarrhea, loss of appetite, dry mouth, sweating, dizziness, lightheadedness, muscle spasms, or changes in sexual function. If they continue or are bothersome, check with your doctor. If you notice other effects not listed above, contact your doctor, nurse, or pharmacist.